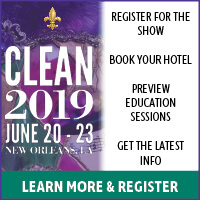 So Who's Going to The Clean Show in New Orleans? 1. So Who's Going to The Clean Show in New Orleans? I signed up for the wife & I to stay at The Renaissance Hotel in June last week. The rooms are going fast, but there's other great hotels available near the Convention Hall. So any of you going to the show? I would enjoy meeting all you Forum buddies. 2. RE: So Who's Going to The Clean Show in New Orleans? I'll be there for work, but if you are in the area of our booth I'd enjoy the opportunity to meet you in person! I appreciate the wealth of information you've shared over the years and we use your secret pretreatment/stain remover at our laundromat for our wash and fold service. Subject: So Who's Going to The Clean Show in New Orleans? I signed up for the wife & I to stay at The Renaissance in June Hotel last week. The rooms are going fast, but there's other great hotels available near the Convention Hall. 3. RE: So Who's Going to The Clean Show in New Orleans? Hey Paulie(and others), I haven't made my reservations yet but I plan to be there. I'd love to meet up with everyone! 4. RE: So Who's Going to The Clean Show in New Orleans? I would love to meet both you guys. I know a lot of guys meet up at the hotel Bar/Restauant of the main hotel during & after dinner...in this case, The Renaissance Hotel, but like all of us, I will be scouring the Convention floor during the day as well. Anyone else coming to the show? It's much more of a plus, than you may realize. You get to see all the newest equipment and gadgets, but it's the networking and brainstorming at night where you can have some real exchange of ideas and opinions. 5. RE: So Who's Going to The Clean Show in New Orleans? 6. RE: So Who's Going to The Clean Show in New Orleans? Larry has it right. Frenchman Str is where it's at. I'll be there at the show as I'm also a dry cleaner. Not staying at a hotel but my buddy and I have a timeshare on St Louis in the Garden District. Have trolly will travel. 7. RE: So Who's Going to The Clean Show in New Orleans? Chances are I'll still be here working. If so, I'll swing through. If not, I'll be back home in Fl. Instead. 8. RE: So Who's Going to The Clean Show in New Orleans? I will be attending as well. Excited to learn new things. 9. RE: So Who's Going to The Clean Show in New Orleans? 10. RE: So Who's Going to The Clean Show in New Orleans? It is on my schedule to go. I love NOLA. We drive and get to pass thru Memphis and the lovely Peabody Hotel and their ducks!!! 11. RE: So Who's Going to The Clean Show in New Orleans? It's really not that far way is it? Registration has been open for a while, so don't wait to sign up. Nawlins speaks for it self, a great time will be had by all. I look forward to seeing as many of you as I possibly can. 12. RE: So Who's Going to The Clean Show in New Orleans? I'll be there! Working my booth of course. And this time, I will not be walking down Bourbon Street in the evening. That was a mistake last time... I saw (and smelled) many things I wish I hadn't! I'm really looking forward to putting faces to the many names I've learned these past few years and getting reacquainted with old friends. It's like my one major social outlet for the whole year! 13. RE: So Who's Going to The Clean Show in New Orleans? I signed up and made all the arrangements,but one thing I would love the most would be to get together with a bunch of guys to talk about Picking up and delivering Laundry, labor cost %, POS systems,packaging,frequency of the route,best van or truck, credit card charges etc. 14. RE: So Who's Going to The Clean Show in New Orleans? Hi Michael, I've been in the pickup and delivery business for about 2 1/2 years and business is booming for us! I'd love to get together and chat with you. My cell is 513-607-1511, give me a buzz when you get to Clean! 15. RE: So Who's Going to The Clean Show in New Orleans? I would love to meet up with this group and discuss these services. We are staying at the Hyatt Place New Orleans Convention Center. Please keep me posted on when and where you will be meeting. 16. RE: So Who's Going to The Clean Show in New Orleans? 1st show was in NO in 1983. been to everyone since. I wish it was in Vegas though. Atlas International Laundry & D/C Equip Co.
17. RE: So Who's Going to The Clean Show in New Orleans? Booked air and hotel today. Booked at the Grenoble House. Really cool hotel with New Orleans charm in the French Market, 1 block from Bourbon and a long walk or short Uber ride to Clean. Love the clean show and always look forward to New Orleans. Definitely my favorite of the host cities. There are so many opportunities to learn something new and always great to meet other owners. Would love to meet other Ohio store owners as well. 18. RE: So Who's Going to The Clean Show in New Orleans? My husband and I are going. This will be our second clean show. We are staying at the Renaissance. We've never been to New Orleans so we're looking forward to it. I did not care for the CLA dinner last time though. The music was so loud that you couldn't even talk to the people at your table, only the person sitting next to you. I hope they do something different this time.